The stone wall along the back side (left side in the image shown below at right) is a retaining wall against the furnace bank. 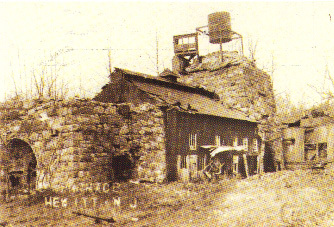 We are about 100 feet and 100 years from the Revolutionary War period furnace and now we are standing before the new furnace built by Hewitt and Cooper Company at the outbreak of the American Civil War. Originally, this furnace stood over 60 feet high, more than twice the size of the Colonial furnace and it had almost twice the output. A high quality gun metal was processed here; in fact the furnace became known as the Gun Metal Furnace. Mr. Hewitt was a major supplier of gun metal to the Union Army and so contributed to the North's important industrial advantage over the Confederacy. By the close of the war, a second furnace was built a few feet away and the two were connected by a large three story casting house (see left image below). The top part of the furnace was later removed in preparation for conversion to running on anthracite coal instead of charcoal. This process was never completed on this furnace, but it was completed on the second furnace which ran for the last 10 years of its operation as a coal furnace. A charcoal furnace burned so hot that there was no smoke to speak of, they actually burned clean. The later steel process developed in Pennsylvania involved the making of coke fuel from coal which released all kinds of nasty smoky pollutants damaging much of the environment in Pennsylvania. To the left of the Gun Metal Furnace, built into the retaining wall, is evidence of another hearth. This was an iron ore roaster where ores were heated prior to charging the furnace. It was discovered early on that pre-roasting the ore removed some of the sulfurs and other undesirable impurities, making for a better finished product. 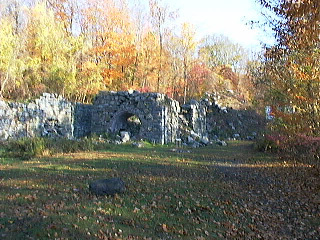 Today, only the foundation remains of the wooden casting house and, on the other side, the overgrown giant mound is the second furnace - named Lucy - built in the 1860s. Lucy was the last furnace to operate here, and went out of blast in 1882 after a hasty relining job caused gases to escape and flames to engulf the furnace. (Iron furnaces were often given a feminine name.) She was rebuilt but the economy had shifted and iron making was now cheaper nearer the coal fields of Pennsylvania. This was one of the last iron making operations here in the Highlands, although you can see many remains throughout these hills. According to local legend, now discounted, Lucy met a peculiar demise. The story was that in 1917 a rather famous silent movie maker came here to Long Pond and began filming. Apparently it was to have been a rather racy movie with naked ladies around the waterfall but in any case, for special effects, dynamite was planted in one of Lucy's arches and she was blown up. Despite extensive research by many, no documentation of any such film, or explosion, has een found.